"When I was thirteen years old, I had a Voice from God to help me govern my conduct. And the first time I was very fearful. And came this Voice, about the hour of noon, in the summer-time, in my father's garden; I had not fasted on the eve preceding that day. I heard the Voice on the right-hand side, toward the church; and rarely do I hear it without a brightness. This brightness comes from the same side as the Voice is heard. It is usually a great light. The Voice was sent to me by God and, after I thrice heard this Voice, I knew that it was the voice of an angel. This Voice has always guarded me well and I have always understood it clearly." 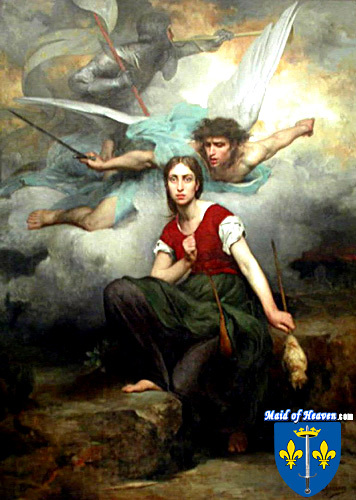 Joan Of Arc talking about her first visit by an angel whom she referred to as her "Voice"
Joan of Arc's Voices are an integral part of the story of Joan of Arc but will always remain somewhat of a mystery as they are part of the mystical side of Joan. Whatever one decides to believe about Joan's Voices one should always remember that they were real to Joan and she had a firm belief in them and never wavered in her belief that they had been sent from God to direct her life. The best way to understand Joan in regard to her Voices is to read Joan's own words describing them and her experiences with them. Joan herself stated at her trial that an angel she later learned was the Archangel Michael first visited her when she was thirteen on a summer day in her father's garden. "It was Saint Michael that I saw before my eyes; and he was not alone but accompanied by many angels of Heaven." Joan also described how she saw them and how she felt: "I saw them with my bodily eyes, as clearly as I see you; and when they departed I used to weep, and wish that they would take me with them." Joan went on to explain how the Archangel Michael instructed her to "be good and go habitually to church." "The Voice told me, two or three times a week, that I, Joan, must go away and that I must go into France. My father knew nothing of my going. The Voice kept urging me to go into France; it said I could no longer remain where I was. The Voice told me that I should raise the siege laid to the city of Orleans. The Voice instructed me that I should make my way to Robert de Baudricourt in the fortress of Vaucauleurs, the Captain of that place, that he would give me men to go with me." 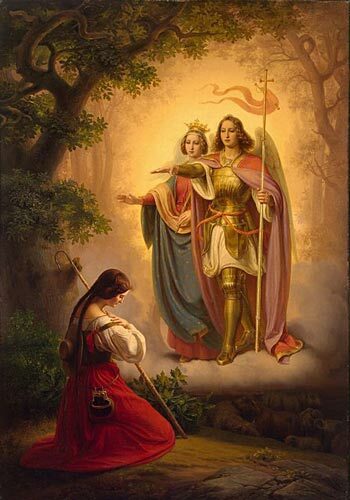 Joan responded to the Archangel Michael with a certain astonishment later saying at her trial: "I answered that I was just a poor girl who knew nothing about riding or leading in war." The Archangel reassured Joan that other Voices would come to help and counsel her: "Saint Michael, when he came to me, told me that Saint Catherine and Saint Margaret would come to me and that I should act by their advice, that they were bidden to lead me in what I had to do and that I should believe in what they would say to me and that it was by God's order." "When I am baffled in some manner, because someone does not wish to credit the things that I speak on the part of God, I retire apart, and I pray to God , complaining that those to whom I speak are hard of belief. 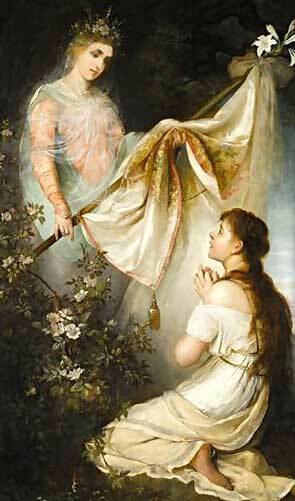 My prayer to God finished, I hear a Voice that says to me: 'Daughter of God, go, go, go; I will aid thee go.' And when I hear this Voice I have great joy. I would like always to hear it." "All that I have done well I have done by commandment of the Voices."